An RV awning is a wonderful thing. It provides shade during the hot summer months, offers shelter from springtime rain showers, and helps keep the RV cool even when you can’t run the air conditioner. That said, some people don’t have any idea how to properly care for their motorhome or trailer awning. 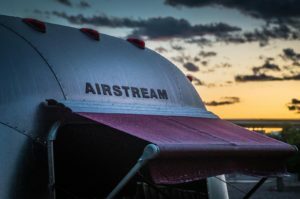 In this article we will discuss the care and keeping of camper awnings, so you can be sure to keep yours in tip-top shape for years to come. 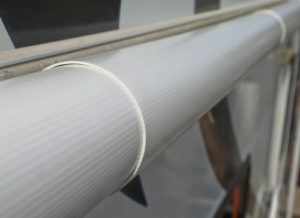 When gathering the tools to clean your RV awning fabric with the care it deserves, the first thing you’ll want to invest in is a good awning cleaner. 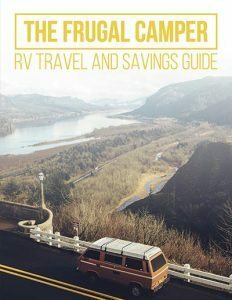 There are actually a number of options out there, and for many RVers, something as simple as warm water with a few squirts of dish soap does the trick. However, some people prefer the convenience and cleaning power of pre-bottled solutions such as B.E.S.T Awning Cleaner. No matter what solution you decide on, make sure it does not contain bleach and isn’t abrasive. Bleach and abrasive cleaners can be damaging to some trailer and motorhome awnings. Once you find the right cleaner, the next step is to get out there and clean your awning. The first thing you’ll want to do is pull the awning out and set it up with a nice downward slope in order to avoid water gathering in the fabric and causing issues. Using a water hose, spray both the underside and top of the awning, making an effort to remove any dirt, mold, or mildew in the process. This initial rinse should get rid of any loose debris, leaving you to scrub at the tougher spots. All scrubbing should be done with a long handled brush. The stiffness of your brush should depend on your RV awning material. Those with acrylic awnings should use a fairly stiff brush. Meanwhile, those with vinyl awnings will want to stick with a softer brush to avoid damaging the fabric. Begin the scrubbing process on the underside of the awning. Spray cleaning solution on one area of the awning you’d like to clean, then scrub gently until all stains have been removed and you feel good about the cleanliness of the area. Repeat this process until the entire awning has been cleaned on both the bottom and the top. Rinse the awning well on both sides using a water hose, making sure no cleaning solution remains, and finish by letting the awning dry completely before retracting it. Awning cleaning should be an important part of your regular RV detailing routine. 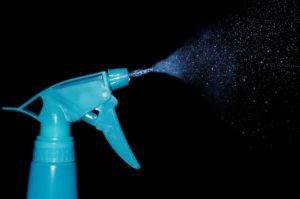 In fact, we recommend doing this at least once every 3 months, and more often if you spend a lot of time in humid climates or in areas with a lot of dirt or debris. Sometimes your awning might need more than just a good cleaning. If you find that your awning is in need of repair, you may be wondering where to pick up RV awning parts. Big camping stores such as Camping World and RV Parts Country both carry some replacement parts. However, some companies allow you to special-order specific parts if need be. One popular example of this is the Dometic awning line. This company is great about providing replacement parts which can be ordered from a number of dealers and service centers. Visit the Dometic website to find one near you. Purchase an RV awning cover to protect your awning when not in use. Always bring your awning in when leaving the camper, and whenever it’s windy or stormy. Try an awning tie-down kit for added strength during unexpected winds. Keeping up with your awning will ensure you have shade and comfort while camping for years to come. Have fun relaxing outdoors!